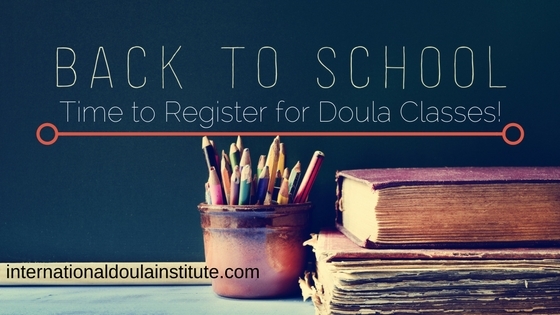 Back to School: Time to Register for Doula Classes! While you’re busy checking things off of the kids’ back to school lists, don’t forget about yourself. Now is the perfect time to sign up for doula classes. Can you believe that the lazy, hazy days of summer are coming to a close? It’s time to start thinking about going back to school! I always thought that there was something pretty exciting about the end of summer. As a kid, the new school year meant new possibilities. A time to start fresh. As an adult, that feeling doesn’t have to end! If you’ve been thinking about signing up for doula classes, now is the perfect time. Whether you’ve been feeling a pull to become a birth doula or a postpartum doula, the International Doula Institute has you covered. Our unique, online training program allows you work through the material at your own pace. We know you’re busy, and we want to make it easy for you to fit your doula classes into your schedule. What will you learn in IDI’s doula classes? As a birth doula, you will be trained to support laboring women. Birth doulas provide educational support, emotional support, and physical comfort measures during pregnancy and childbirth. As a postpartum doula, you will be trained not only to “mother the mother”, but also support the family as a whole. Postpartum doulas are there to ease the transition of adding a new baby to the family. You’ll learn about basic baby care, normal newborn behavior, breastfeeding support, postpartum recovery for mom, and much more. What’s more: we’ll also teach you business basics. You’ll learn how to sell your doula services, how to get your name out there, and how to turn new contacts into clients. Why should I earn a doula certification? After completing IDI’s doula classes, you will be able to proudly display the credentials CD (certified doula) and/or CPD (certified postpartum doula) next to your name. This tells your clients that you’re passionate and serious about your work as a doula. It tells them that you’ve put in the effort to learn everything you need to know to help them have the best birth and postpartum experience possible. Furthermore, this is a growing field. Even the World Health Organization recommends that all birthing women have the support of a doula. Therefore, not only could you be doing what you love this year, you can also make money doing it. So, after you’re finished helping your kids pick out new backpacks, notebooks, and pens, take some time for yourself. Register for doula classes. Learn something new. And turn your passion for helping moms and babies into a rewarding career.